CHURCH bells rang out across the country on November 11, 1918, to help proclaim victory and peace at the end of the First World War. Partly that’s because bell-ringing was restricted during the four years of war, so ringers spontaneously volunteered to ring on Armistice Day as an expression of their relief that the war was over. Those working in the Royal Dockyard in Portsmouth were given special permission to leave to ring the bells of our cathedral and St Mary’s, Portsea, at 12noon. The ringing continued at intervals until the evening. So it seems appropriate for church bells to be rung again 100 years later. Our cathedral will be just one of the churches where peals of bells will sound on November 11. As is the custom on Remembrance Sunday, the peal will be half-muffled. The bells will sound from 9.45am until 10.30am, prior to the morning service, and continuously from 1pm until 6pm, when 10 ringers will perform a special composition of 7,000 changes. Ringers at St Peter's Church, Petersfield, will be remembering their townsfolk who are listed on the war memorial in their High Street. During 10 evenings leading up to Remembrance Sunday, 11 named servicemen will be remembered by ringing for 11 minutes on each day. Tributes on other evenings will honour those who perished when serving in the Royal Flying Corps, Royal Navy, British Army, Royal Marines and Marchant Navy. Another way in which bell ringers are marking the anniversary is by recruiting more than 1,400 extra ringers - in memory of the 1,400 ringers thought to have lost their lives serving their country during the First World War. Many are reporting that they are doing so in memory of and to honour a relative who had died in the Great War. 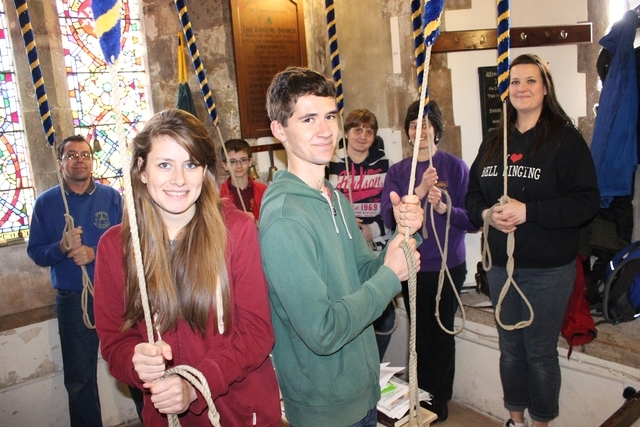 The Winchester and Portsmouth Diocesan Guild of Church Bell Ringers is also compiling archives of those historic bell-ringing events from 100 years ago, in honour of those ringers and non-ringers killed in the conflict. They will also come together for Evensong at Portsmouth Cathedral on May 12, 2019, and at Winchester Cathedral on May 19, 2019, to ring bells in memory of those who died during the conflict.